ABSTRACT. Gitelman’s syndrome is an autosomal recessive renal tubular disorder characterized by hypokalemic metabolic alkalosis, hypomagnesemia, and hypocalciuria. This disorder results from mutations in the thiazide-sensitive NaCl cotransporter (NCC). To elucidate the functional implications of mutations associated with this disorder, metolazone-sensitive 22Na+ uptake, subcellular localization, and glycosidase-sensitive glycosylation of human NCC (hNCC) were determined in Xenopus laevis oocytes expressing FLAG-tagged wild-type or mutant hNCC. Injection of 10 ng of FLAG-tagged hNCC cRNA resulted in metolazone-sensitive 22Na+ uptake of 3.4 ± 0.2 nmol Na+/oocyte per 2 h. Immunocytochemical analysis revealed sharp immunopositive staining at the plasma membrane. In agreement with this finding, a broad endoglycosidase H-insensitive band of 130 to 140 kD was present in Western blots of total membranes. The plasma membrane localization of this complex-glycosylated protein was confirmed by immunoblotting of purified plasma membranes. The mutants could be divided into two distinct classes. Class I mutants (G439S, T649R, and G741R) exhibited no significant metolazone-sensitive 22Na+ uptake. Immunopositive staining was present in a diffuse band just below the plasma membrane. This endoplasmic reticulum and/or pre-Golgi complex localization was further suggested by the complete absence of the endoglycosidase H-insensitive band. Class II mutants (L215P, F536L, R955Q, G980R, and C985Y) demonstrated significant metolazone-sensitive 22Na+ uptake, although uptake was significantly lower than that obtained with wild-type hNCC. The latter mutants could be detected at and below the oocyte plasma membrane, and immunoblotting revealed the characteristic complex-glycosylated bands. In conclusion, this study substantiates NCC processing defects as the underlying pathogenic mechanism in Gitelman’s syndrome. Gitelman’s syndrome (Online Mendelian Inheritance in Man no. 600968) is an autosomal recessive disease characterized by hypokalemic metabolic alkalosis, hypomagnesemia, and hypocalciuria (1). The first clinical presentation usually occurs at >6 yr of age and may include transient episodes of weakness and tetany. The disease is generally mild, and some patients even remain without symptoms (2,3). Gitelman’s syndrome is caused by mutations in the SLC12A3 gene, which encodes the thiazide-sensitive NaCl cotransporter (NCC). NCC is expressed at the apical membrane of the distal convoluted tubule (DCT), and loss of NCC function leads to decreased Na+ and Cl− reabsorption in the DCT, which normally reabsorbs approximately 7% of the filtered load of NaCl. Decreased Na+ reabsorption in the DCT leads to increased solute delivery to the collecting tubule, with consequent mild volume contraction and aldosterone-stimulated secretion of K+ and H+, finally resulting in mild hypokalemic metabolic alkalosis (4). The mechanisms leading to hypomagnesemia and hypocalciuria in Gitelman’s syndrome remain unclear (4). The electrolyte disturbances resemble those observed with chronic administration of thiazide diuretics (specific inhibitors of NCC that are frequently used in the treatment of hypertension). NCC has been cloned from various species and is a member of the cation/chloride cotransporter gene family, which also includes the bumetanide-sensitive Na+/K+/2Cl− cotransporter (5–11). The two-dimensional structure of NCC is predicted to contain 12 transmembrane domains and intracellular amino- and carboxy-terminal regions (7). The mutations identified in Gitelman’s syndrome are located throughout the entire coding sequence of the protein and include missense, frameshift, nonsense, and splice-site mutations (9). The aim of this study was to elucidate the functional implications of NCC mutations identified in Gitelman’s syndrome. To this end, NCC was cloned from a human kidney cDNA library. Functional and immunocytochemical analyses of eight mutant human NCC (hNCC) proteins heterologously expressed in Xenopus laevis oocytes were then performed. The studied NCC mutations are summarized in Figure 1. Newly identified mutations and previously reported but not yet functionally characterized mutations were investigated in this study. 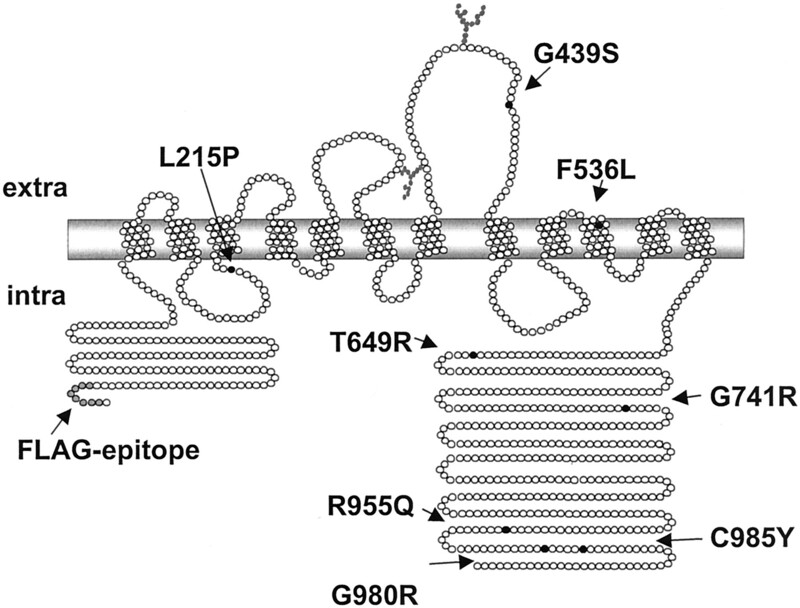 L215P is located below transmembrane region 3, G439S is situated in the fourth extracellular loop, F536L is located in transmembrane region 10, and T649R, G741R, R955Q, G980R, and C985Y are located in the carboxy terminus. G741R accounts for 10% of Gitelman’s syndrome cases (8). R955Q is located in a putative protein kinase C phosphorylation consensus sequence. Figure 1. Predicted membrane topology of the human thiazide-sensitive NaCl cotransporter (hNCC). Two potential glycosylation sites are indicated by branched structures. The locations of the selected mutations that were previously identified in Gitelman’s syndrome are indicated. The FLAG epitope was cloned at the amino terminus. Wild-type NCC was obtained from a human cDNA library by means of PCR and was cloned into a PGEM-Teasy vector (Promega, Madison, WI). NCC was cloned into BglII and SpeI sites between the 5′- and 3′-untranslated regions of Xenopus β-globin gene in the expression vector T7TS pT7TSNCC), which is closely related to pSP64T (12). For detection of hNCCprotein expressed in oocytes, DNA encoding the FLAG epitope tag (DYKDDDDK) (IBI, Kodak, New Haven, CT) was cloned at the 5′-end of wild-type NCC (Figure 1). The FLAG-DNA was amplified with Pfu polymerase (Stratagene, La Jolla, CA), using the forward primer (containing a Kozak sequence) (13) 5′-CGC GGATCCGCCACCATGGACTACAAGGAT-GACGATGACAAGGCAGAACTGCCCACAACAG-3′ and the reverse primer 5′-CTCCTGGAGCAGGTCCCG, in a PCR using the wild-type hNCC construct as a template. The PCR fragments obtained were digested with BamHI (site underlined in the sequence) and NaeI. The resulting fragment of 463 bp was isolated from the gel with standard procedures and was cloned into BamHI/NaeI-digested pT7TSNCC. Site-directed mutagenesis (QuikChange site-directed mutagenesis kit; Stratagene) was performed to obtain eight mutants of FLAG-tagged hNCC. After site-directed mutagenesis, the hNCC mutants obtained were analyzed by DNA sequencing. Constructs with hNCC mutants were linearized with EcoRI and m7G(5′)ppp(5′)G-capped cRNA transcripts were synthesized in vitro, using T7 RNA polymerase, according to the protocols and principles guide (1991) provided by Promega, except for the use of nucleotide triphosphates and 7-methyl-diguanosine triphosphate at a final concentration of 1 mM. cRNA were purified and dissolved in diethylpyrocarbonate-treated water. The integrity of the cRNA was confirmed by agarose gel electrophoresis, and cRNA concentrations were determined with a spectrophotometer. Oocytes were isolated from X. laevis and defolliculated by digestion at room temperature for 2 h with 2 mg/ml collagenase A (Boehringer Mannheim, Mannheim, Germany). Stage V and VI oocytes were selected and stored at 18°C in modified Barth’s solution [88 mM NaCl, 1 mM KCl, 2.4 mM NaHCO3, 10 mM Hepes/Tris, pH 7.5, 0.8 mM MgSO4, 0.3 mM Ca(NO3)2, 0.4 mM CaCl2] supplemented with 48 μg/ml gentamicin. Oocytes were injected with 10 ng (unless otherwise indicated) of wild-type or mutant hNCC cRNA and were used for analyses 2 d after injection. Oocytes were transferred to Cl−-free medium [96 mM sodium gluconate, 2 mM potassium gluconate, 1.8 mM calcium gluconate, 1 mM Mg(NO3)2, 5 mM Hepes/Tris, pH 7.5, 2.5 mM sodium pyruvate, 48 μg/ml gentamicin] 24 h before the uptake assay (6). Fifteen to 20 Cl−-depleted oocytes were transferred to 500 μl of uptake medium (58 mM N-methyl-d-glucosamine-HCl, 38 mM NaCl, 2 mM KCl, 1.8 mM CaCl2, 1 mM MgCl2, 5 mM Hepes/Tris, pH 7.5, 0.5 mM ouabain, 100 μM amiloride, 100 μM bumetanide, 1 μCi/ml 22Na+) for 2 h at room temperature, with or without 100 μM metolazone. Ouabain was added to prevent Na+ exit via the Na+/K+-ATPase, bumetanide to inhibit the Na+/K+/2Cl− cotransporter, and amiloride to block the Na+/H+ antiporter and Na+ channels. The uptake reaction was stopped after 120 min by five washes of the oocytes with ice-cold uptake medium. Each oocyte was solubilized in 200 μl of 10% (w/v) sodium dodecyl sulfate, and radioactivity was counted in a liquid scintillation counter. For isolation of total membranes, 50 injected or noninjected oocytes were homogenized in 1 ml of homogenization buffer (20 mM Tris-HCl, pH 7.4, 5 mM MgCl2, 5 mM NaH2PO4, 1 mM ethylenediaminetetraacetate, 80 mM sucrose, 1 mM phenylmethylsulfonyl fluoride, 5 μg/ml leupeptin, 5 μg/ml pepstatin) and centrifuged two times for 10 min at 3000 × g at 4°C, to remove yolk proteins. Next, membranes were isolated by centrifugation for 30 min at 14,000 × g at 4°C. 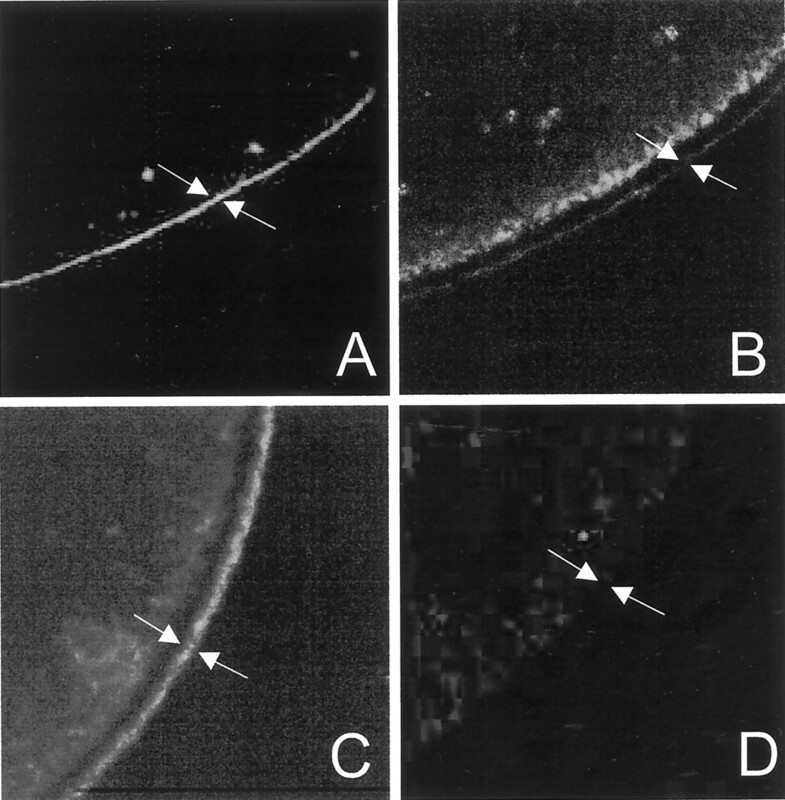 Plasma membranes were isolated as described previously (14). Briefly, 12 oocytes were coated with 1% (w/v) silica in modified 2-(N-morpholino)ethanesulfonic acid-buffered saline for silica (MBSS) [20 mM 2-(N-morpholino)ethanesulfonic acid/NaOH, pH 6.0, 80 mM NaCl], washed twice with MBSS, and incubated with 0.1% (w/v) polyacrylic acid in MBSS. In both incubations, oocytes were rotated slowly for 30 min at 4°C. After two washes with modified Barth’s solution, the oocytes were homogenized in homogenization buffer. After five washing steps with slow centrifugation (three steps at 14 × g, one step at 24 × g, and one step at 390 × g) for 30 s at 4°C, plasma membranes were pelleted by centrifugation at 14,000 × g for 20 min at 4°C. Digestion of proteins with N-glycosidase F (PGNase F) and endoglycosidase H (Endo H) (New England Biolabs, Beverly, MA) was performed according to the protocol provided by the manufacturer. The protein samples were denatured by incubation for 30 min at 37°C in Laemmli buffer, subjected to electrophoresis on 6% (w/v) sodium dodecyl sulfate-polyacrylamide gels, and immunoblotted onto polyvinylidene difluoride membranes (Millipore Corp., Bedford, MA) by standard procedures. Blots were incubated with mouse anti-FLAG (Sigma Chemical Co., St. Louis, MO) diluted 1:8000 in Tris-buffered saline supplemented with 5% (w/v) nonfat dried milk. Blots were then incubated with sheep horseradish peroxidase-conjugated anti-mouse IgG (1:2000 dilution; Sigma). Finally, NCC proteins were observed by using an enhanced chemiluminescence system (Pierce, Rockford, IL). The subcellular localization of NCC was determined in immunocytochemical analyses. To this end, the remaining vitelline membranes were removed 2 d after injection, and oocytes were incubated for 1 h at room temperature in 1% (w/v) paraformaldehyde fixative, dehydrated, and embedded in paraffin (15). Sections (7 μm) were cut, deparaffinized, washed once in TN buffer (100 mM Tris-HCl, pH 7.6, 150 mM NaCl), and blocked in TNB buffer (TN buffer containing 0.5%, w/v, blocking reagent, NEN Renaissance TSA-direct kit; Perkin-Elmer Life Sciences, Boston, MA). The sections were incubated overnight at 4°C with mouse anti-FLAG M2 antibody (Sigma) diluted 1:200 in TNB buffer. After three 5-min washes in TNT buffer (TN buffer containing 0.05%, w/v, Tween-20), the sections were incubated at room temperature for 1 h with a 1:250 dilution of Alexa 488-conjugated goat anti-mouse IgG (Molecular Probes, Eugene, OR). The sections were washed three times in TNT buffer, dehydrated in 50% (w/v) methanol followed by 100% (w/v) methanol, and finally mounted in Mowiol 4-88 (Hoechst, Frankfurt am Main, Germany) containing 2.5% (w/v) NaN3. Photographs were taken with a Zeiss Axioskop microscope (Carl Zeiss Jena GmbH, Jena, Germay) with epifluorescent illumination and an automatic camera, using Kodak EPH P1600X film. Because affinity-purified antibodies directed against the amino-terminal part of hNCC yielded nonspecific background binding when used on oocyte paraffin sections, a FLAG epitope was incorporated at the amino terminus, to allow immunocytochemical detection. As demonstrated in Figure 2A, the 22Na+ uptake rates for hNCC and FLAG-tagged hNCC were identical; therefore, FLAG-tagged hNCC was used in all experiments as the wild-type protein. 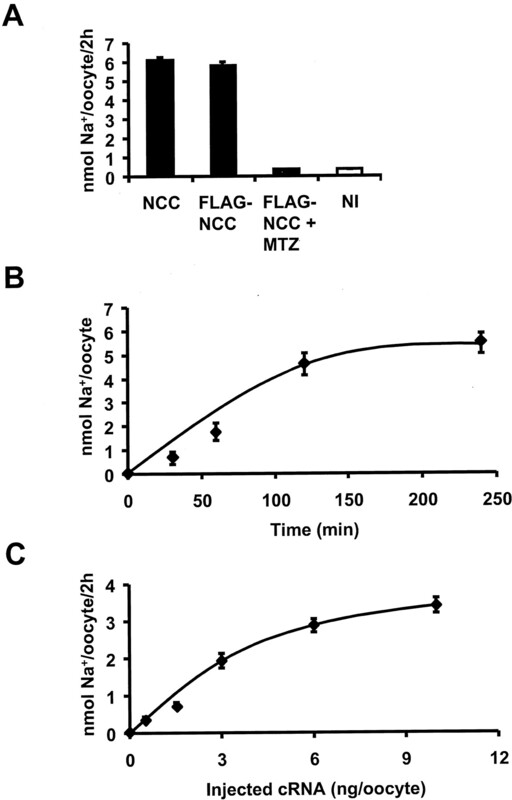 Furthermore, 100 μM metolazone (a thiazide derivative) inhibited the uptake of 22Na+ in FLAG-tagged hNCC-expressing oocytes to the background levels observed in noninjected oocytes. Noninjected oocytes demonstrated basal Na+ uptake of 0.43 ± 0.01 nmol Na+/oocyte per 2 h. The metolazone-sensitive Na+ uptake by FLAG-tagged hNCC was linear up to 2 h of incubation (Figure 2B). Oocytes injected with 0.5 to 3 ng of FLAG-tagged hNCC cRNA displayed 1- to 4.5-fold increases in metolazone-sensitive Na+ uptake over these basal levels, and injection of 10 ng of cRNA resulted in a maximal uptake of 3.4 ± 0.2 nmol Na+/oocyte per 2 h (Figure 2C). Immunoblots of total membranes isolated from oocytes injected with 10 ng of hNCC demonstrated specific bands of 110 and 130 to 140 kD (Figure 3A, lane 2). For determination of the maturation of NCC, total membrane lysates were treated with the glycosidases Endo H and PGNase F. Endo H cleaves only high-mannose-glycosylated forms and some hybrid oligosaccharides from N-linked glycoproteins (16). Therefore, Endo H-sensitive proteins likely remain in the endoplasmic reticulum and pre-Golgi complex without further processing. PGNase F cleaves nearly all types of N-glycans, however, and was used as a control for glycosylation (Figure 3A, lane 3). The 110-kD band was sensitive to Endo H, whereas the band of 130 to 140 kD was not (Figure 3A, lanes 3 and 4). This indicates that the 110-kD protein contains high-mannose glycosylation and is retained in the endoplasmic reticulum or pre-Golgi complex, whereas the 130- to 140-kD protein contains complex glycosylation. A highly purified plasma membrane preparation isolated from oocytes injected with 10 ng of cRNA FLAG-tagged hNCC revealed a single band of approximately 130 kD, with complex glycosylation, which was sensitive to PGNase F (Figure 3B, lanes 2 and 3). The Endo H and PGNase F digestions revealed that the nonglycosylated core protein migrated with an apparent molecular size of 95 kD (Figure 3A, lanes 3 and 4). Figure 2. (A) Uptake of 22Na+ by noninjected (NI) oocytes and oocytes injected with cRNA for hNCC (NCC) or FLAG-tagged hNCC (FLAG-NCC). In the presence of 10−5 M metolazone (MTZ), the oocytes demonstrated 22Na+ uptake indistinguishable from that of noninjected oocytes. (B) Metolazone-sensitive 22Na+ uptake by oocytes injected with 10 ng of FLAG-tagged hNCC cRNA, measured at different times of incubation. (C) Metolazone-sensitive 22Na+ uptake by oocytes injected with different amounts of FLAG-tagged hNCC cRNA, measured at 2 h of incubation. Figure 3. (A) Immunoblot of total membranes isolated from noninjected (NI) oocytes (lane 1) and oocytes injected with 10 ng of FLAG-tagged hNCC cRNA (lanes 2 to 4). Oocyte preparations were treated with N-glycosidase F (PGNase F) (lane 3) or endoglycosidase H (Endo H) (lane 4). (B) Immunoblot of highly purified plasma membrane preparations from noninjected oocytes (lane 1) and hNCC-expressing oocytes treated without (lane 2) or with (lane 3) PGNase F.
Oocytes were injected with 10 ng of wild-type or mutant hNCC cRNA, and metolazone-sensitive 22Na+ uptake rates were then determined, as demonstrated in Figure 4. The mutants G439S, T649R, and G741R demonstrated 22Na+ uptake rates comparable to that of noninjected oocytes. Even at very high injection levels (25 ng of cRNA), Na+ uptake was similar to background levels (data not shown). In contrast, the mutants L215P, F536L, R955Q, G980R, and C985Y all displayed significant, albeit reduced (compared with wild-type values), metolazone-sensitive 22Na+ uptake. Figure 4. Effects of mutations in hNCC on metolazone-sensitive 22Na+ uptake. Values are expressed as percentages of wild-type (WT) uptake values (100% corresponds to an uptake of 2.1 nmol Na+/oocyte per h). Oocytes were injected with 10 ng of cRNA. These data are the mean of three independent measurements, each consisting of at least 15 oocytes/mutant. Total membrane lysates of oocytes expressing mutant hNCC were prepared and subjected to immunoblotting, for examination of the expression and glycosylation characteristics of NCC (Figure 5). The lanes with lysates of oocytes expressing the mutants G439S, T649R, and G741R demonstrated a single specific band of 110 kD. Total membrane lysates of oocytes expressing the mutants L215P, F536L, R955Q, G980R, and C985Y displayed the wild-type NCC profile, with bands of 110 and 130 to 140 kD. Figure 5. Immunoblot of total membranes isolated from noninjected (NI) oocytes and oocytes expressing FLAG-tagged wild-type (WT) hNCC or mutants G439S, T649R, G741R, L215P, F536L, R955Q, G980R, and C985Y. The absence of Na+ transport can be attributable either to the absence of the transporter at the plasma membrane or to its inactivity. For investigation of these possibilities, sections of oocytes expressing the different mutants were stained with anti-FLAG antibody, to reveal the subcellular localization of hNCC. In sections of oocytes expressing wild-type hNCC, clear staining at the plasma membrane (which was absent in noninjected oocytes) was observed (Figure 6, A and D). The sections of oocytes expressing mutants that exhibited no significant Na+ uptake (G439S, T649R, and G741R) demonstrated predominant intracellular staining, with only minor staining at the plasma membrane (Figure 6B). Oocytes expressing mutants that exhibited metolazone-sensitive 22Na+ uptake (L215P, F536L, R955Q, G980R, and C985Y) revealed significant immunopositive staining of both the plasma membrane and the cytoplasm (Figure 6C). Figure 6. Immunocytochemical analyses of oocytes injected with 10 ng of FLAG-tagged hNCC or mutant cRNA. (A) Oocytes expressing FLAG-tagged hNCC demonstrated clear immunopositive staining of the plasma membrane. (B) Oocytes expressing class I mutant T649R exhibited a diffuse band just below the membrane. 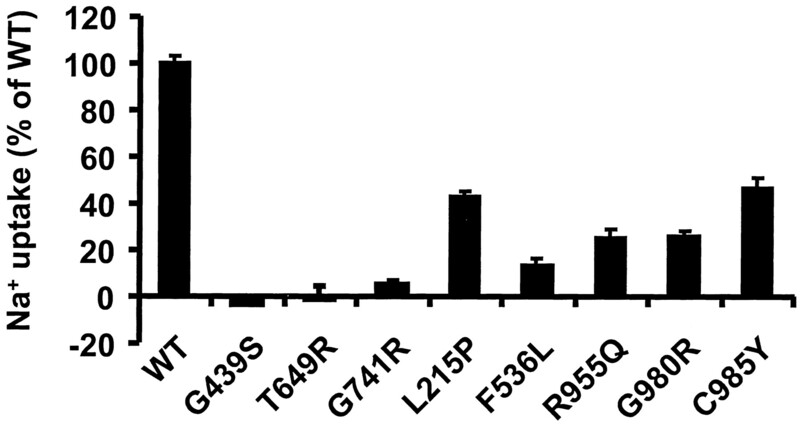 The results of the immunocytochemical analyses of G439S and G741R were similar. (C) Oocytes expressing the functional mutant L215P demonstrated immunopositive staining at the plasma membrane and intracellularly. The mutants F536L, R955Q, G980R, and C985Y exhibited similar staining. (D) Noninjected oocytes exhibited background staining only. Typical results of representative experiments are shown. Magnification, ×400. This study characterizes for the first time hNCC, which, after expression in X. laevis oocytes, exhibited marked metolazone-sensitive 22Na+ uptake. The wild-type transporter was predominantly expressed at the plasma membrane, as demonstrated in immunocytochemical analyses; it is a glycoprotein and exhibited distinctive bands on immunoblots that corresponded to molecular masses of 110 and 130 to 140 kD. These bands were sensitive to digestion with PGNase F, demonstrating that they represented the glycosylated forms of the protein. The nonglycosylated core protein exhibited a molecular mass of approximately 95 kD. The 110-kD band was sensitive to Endo H digestion, thus corresponding to the endoplasmic reticulum- and/or pre-Golgi complex-retained protein. The glycosylated protein of 130 to 140 kD was insensitive to Endo H digestion and was present in an enriched fraction of oocyte plasma membranes, indicating that NCC is present at the plasma membrane as a protein with complex glycosylation. Comparable findings were recently reported for the mouse homologue of NCC (10). 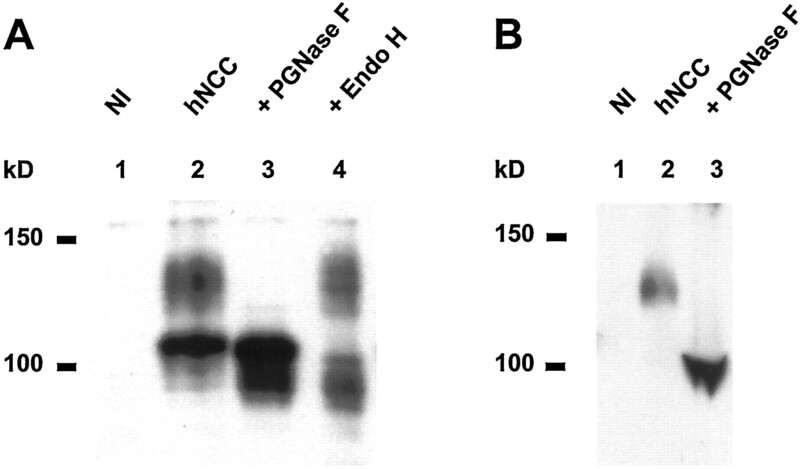 Western blots of oocytes injected with mouse NCC demonstrated bands representing glycosylated (120 to 140 kD) and nonglycosylated (110 kD) forms of the transporter; the Endo H sensitivity of the latter band was not tested, however (10). The functional implications of NCC mutations that were previously identified among patients with Gitelman’s syndrome were investigated in the X. laevis oocyte expression system (Table 1). We selected three newly identified and five previously described but not yet functionally tested hNCC mutations for our study. In principle, there are multiple mechanisms by which mutations could reduce or abolish NCC activity, including impaired synthesis or routing of NCC, disturbed transport activity, and increased retrieval or degradation. On the basis of the metolazone-sensitive 22Na+ uptake rates for the hNCC mutants and the results of immunocytochemical analyses, two different classes of mutations (i.e., endoplasmic reticulum-retained mutants and partly functional mutants) could be distinguished. Class I mutants (G439S, T649R, and G741R) did not exhibit significant metolazone-sensitive 22Na+ uptake. Immunocytochemical analyses demonstrated that these mutant proteins were expressed predominantly in the cytoplasm and were virtually undetectable at the plasma membrane. These mutant transporters lacked the typical complex-glycosylated band of 130 to 140 kD. Together, these findings suggest that these partly glycosylated mutants are impaired in their routing to the plasma membrane and are retained in the endoplasmic reticulum/pre-Golgi complex. For a growing number of transporters, it has been demonstrated that endoplasmic reticulum retention is caused by defective folding of the protein, which is subsequently degraded by intracellular proteases (17,18). Even minor changes in protein structure can be recognized by the quality control system of the endoplasmic reticulum. Two well known examples of protein misfolding that are responsible for human disease are the ΔF508 mutant of the cystic fibrosis transmembrane conductance regulator and mutants of aquaporin-2 observed in autosomal recessive nephrogenic diabetes insipidus (19,20). Furthermore, molecular chaperones contribute to the quality control system by assisting in the folding of processed proteins (21). The carboxy terminus of NCC was recently observed to bind to chaperone grp58, indicating that regulatory proteins may be involved in transporting NCC from the endoplasmic reticulum to other compartments in the cell for further processing (22). It has been demonstrated that chemical and pharmacologic chaperones can reverse the intracellular retardation of misrouted proteins (23–25). Use of this type of agent with class I mutants may be beneficial in overcoming the retardation of the mutant proteins. In contrast to the aforementioned mutants, five of the selected mutations (class II; L215P, F536L, R955Q, G980R, and C985Y) exhibited significant, albeit reduced (compared with wild-type NCC values), metolazone-sensitive 22Na+ uptake. Immunoblot analysis of total membranes from oocytes expressing these mutants revealed the Endo H-insensitive protein band of 130 to 140 kD, suggesting that these mutant proteins contain complex glycosylation and are processed correctly in the endoplasmic reticulum/pre-Golgi complex. Mutant proteins of this class are present at the plasma membrane, as demonstrated in immunocytochemical analyses, but are also clearly located in the cytoplasm (unlike the wild-type protein). These findings indicate that the process of routing NCC to the cell surface is only partly impaired, which is in line with the observed reduction in metolazone-sensitive 22Na+ transport capacity. The cytosolic localization of class II proteins differs from that of class I proteins. Instead of a broad diffuse band just beneath the plasma membrane, overall intracellular staining was observed. This finding suggests that different mechanisms are involved in the disturbed trafficking for the two mutant classes, but the molecular mechanisms responsible remain to be established. Previously published studies of other transporters expressed in oocytes suggested that post-translational processes, such as phosphorylation, can also control the trafficking process. For example, the endocytosis and exocytosis of the Na+/glucose transporter (SGLT1) heterologously expressed in oocytes are regulated by protein kinase A or C (26). Furthermore, the S256A mutant of aquaporin-2, which produces dominant nephrogenic diabetes insipidus, lacks protein kinase A-dependent phosphorylation, resulting in a functional but partly misrouted water channel (27). Interestingly, the R955Q mutation in NCC is located in a putative protein kinase C consensus site that is conserved in all species studied to date, and G980R and C985Y are located in the same region. The class II mutants F536L and L215P are not located in known consensus sites for post-translational processing. However, these mutations could disrupt hitherto unknown motifs for trafficking to or from the plasma membrane. Together, these findings indicate that the class II mutants, although they are partly impaired in their routing to the plasma membrane, form functional cotransporters when they reach the cell surface. The phenotype of patients with Gitelman’s syndrome is generally homogeneous and includes hypomagnesemia, hypocalciuria, and hypokalemic metabolic alkalosis. Our patients with Gitelman’s syndrome all exhibited these characteristic biochemical features. Significant differences in these parameters could not be detected, because only a small number of patients were screened (three patients with class I mutations and five patients with class II mutations). In addition, six of the screened patients were compound heterozygous, with both class I and class II mutations. Taken together, the total number of patients studied is too small for the establishment of meaningful genotype/phenotype correlations. Our study confirms the findings reported by Kunchaparty et al. (10). In that study, eight mutations that had been reported to cause Gitelman’s syndrome were introduced into mouse NCC and studied via functional expression in oocytes. All of the mutant proteins were retained in the endoplasmic reticulum as nonglycosylated proteins, like our class I mutants. Importantly, our study presents evidence for an additional mechanism by which mutations disturb the function of NCC in Gitelman’s syndrome. Some mutants (referred to as class II) seem to partly escape the quality control system of the endoplasmic reticulum, to reach the plasma membrane as functional complex-glycosylated transporters. For further elucidation of the molecular mechanisms responsible for defective processing of these NCC mutants, representative mutants of both classes should be expressed in a polarized mammalian expression system. We thank Drs. Leo Monnens and Carel van Os for stimulating discussions and Karin Assink for synthesis of the initial hNCC construct.